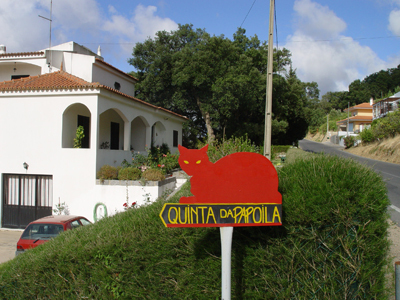 The Hotel para Gatos is located in beautiful Monchique in the Algarve. To find us just follow signs to Monchique. From Monchique village pick up signs to Foia and drive for 2.5km. Turn left at the cat sign at the foot of restaurant O LUAR (pictured below). Follow the road until you see the next sign (pictured above) which leads you right to Quinta da Papoila where the hotel is located.